How do you handle it when you are feeling insecure or afraid? I discovered an answer that surprised me…and it may surprise you! A few years ago I realized that I was really insecure, and I could see how that was affecting my life. My lack of security and lack of confidence was having a big negative effect, and I decided I was going to become more confident. For over a year I did everything I could think of to grow my confidence. The truth is that none of it worked. I was still plagued by this feeling of insecurity. And I remember laying in bed with my wife one night complaining about it. She rolled over at one point half asleep and she said “I think you just need to embrace it”. I said “What?” and she said, “Embrace your insecurity”. Then she rolled back over and went to sleep, and I was so mad. Embrace it? I’ve been trying for a year to get rid of it. What do you mean embrace it? What does that even mean? I couldn’t get that thought out of my head, so for the next few days I thought about it and I figured that since nothing else works I might as well. I’m going to try it. I’m going to embrace it, accept it, and be open with other people, and just admit that this is what’s going on, and that’s how I’m feeling. So a couple of weeks later I’m in a meeting at work and we’re talking about a project, and I was assigned some things to do that I didn’t really know how to do. I could feel that insecurity rising up in me. So I stopped and I said, “I’m feeling really insecure right now. I don’t really know how to do these things and I’m afraid I’m going to mess up the project and disappoint you. I don’t want to let you guys down.” So we talked a little bit and they were encouraging. We made some plans and went on- It was fine. Now here’s the deal. Years later, I find that I’m still insecure at times. I still have that feeling rise up inside me, but it no longer controls me. Hiding those things and denying those things, or just trying to overcome them somehow actually empowers them to have a bigger impact on your life. What I discovered was that embracing and accepting those feelings, and then facing them and making decisions, that moving forward in spite of them actually empowers you. Now your thing might not be insecurity. All of us have some fears or weaknesses or things that we struggle with that sabotage us. I want to encourage you to consider a different route in dealing with them. Rather than just trying to pretend that they’re not there, or ignore them, face them. Embrace them. Even be open about it with other people. You may just find that that’s the pathway to freedom. 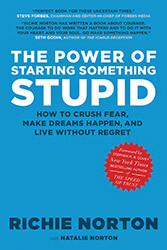 The Power of Starting Something Stupid captures a profound idea—that new ideas often seem stupid at the beginning, which makes them so easy to dismiss! I wonder how many good ideas were never acted on because they seemed stupid? In thinking about this, I realized that dismissing an idea as stupid is a brilliant way to avoid stepping out and taking a risk. Of course, that also means it’s a brilliant way to not make any progress or accomplish important goals. Of course, few of us say that. We are more likely to say that we don’t have the time, education, or money we need to move forward. And since almost all of us feel like we lack those, it’s a very acceptable excuse. But Norton shows why they aren’t really good excuses—they are always there, and many people have pressed through them to make amazing things happen. It’s ironic to me how often I have heard myself or someone I know use those very excuses. At the same time, everything I have succeeded at has required me to get past those very limitations. I can’t think of a time where I had enough time, education, and money to do anything important. Every breakthrough or progress I’ve made came when I stepped out in spite of not having enough. In that sense, it was never a smart move. But it often worked out because the resources came over time. I learned how to manage time, I got an education as I moved forward, and found ways to get the needed money or found a way to move forward without it. All those reasonable excuses weren’t really valid. I also liked Norton’s description of the “Deferred Life Plan” that many people are on—do what you have to do now (make money) so that you can do what you want to do later. Most people have bought into that idea to one degree or another—but really, what an unfulfilling way to live. Of course there are things that we have to do now, but I’m learning that often we don’t have to defer the things we want—we can pursue them now, and end up with a lifetime of great experiences. We just have to change our mind-set and embrace some risk. How about you? Have you ever started something stupid only to find out it was a really good idea? What things have hindered you from taking that step? I know someone like this, and it is a sad situation. The man is a gifted leader, but he has seen a steady stream of people leaving his church for at least the last 5 years. Most of them share a common story: he is highly controlling and they don’t trust him. Ironically, despite the consistency of that report, he doesn’t see it. I believe he thinks he is demonstrating strong leadership and the problem is on their end. I’m not sure if it is his controlling behavior that is the fatal flaw, or if it is his blindness to the problem. Either way, the flaw is having a significant impact on his ministry, and not in a good way. It seems to me like we have to be determined to recognize our flaws and to deal with them. It takes real courage to pursue the truth about ourselves and to ask the people around us, or the people who have left, to tell us the truth: “Is there something about who I am or how I do things that is undercutting me? Is there a place where I am my own worst enemy?” It’s all too easy to dismiss their feedback—or not pursue it in the first place. As I think about it, the first step for the man I mentioned, or anyone, is to identify the flaw. After that, acknowledging it, either publicly or to the people who are closest to us, is key. That step of humility will go a long way in gaining back the ground we have lost. And then we have to work on it. I think that is the easier part—once we have admitted to ourselves and others that there is a problem, we can get ongoing feedback and grow to a better place. But if we don’t recognize or acknowledge the issue, we are stuck. So here’s my question—have you ever dealt with a leader who has a fatal flaw? A problem that is significantly undercutting their ministry—one that has become identified with who they are? What was the flaw, and how was it dealt with (if it was)? 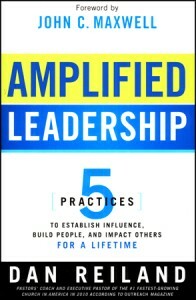 All leaders I know want to amplify their impact. I think that desire is probably part of the DNA of leadership. Dan Reiland gives some great insight into how to do just that. There were a couple things he said that dovetailed with some of the things I’ve observed over the years. I see it the same way. There are many competent people out there—many people who can get the job done. But if they aren’t people I enjoy spending time with, they aren’t the right ones for the job. Think about it—even if they are good at what they do, the workplace itself won’t be a positive place. It might not be horrible—it’s not that extreme—but there is a synergy that happens and a momentum that comes when people really enjoy working together. They end up performing at a higher level. I think sometimes in the church we shy away from that. It can seem fleshly, selfish, or unfair to think about hiring people we like. We think we should make hiring decisions on a purely objective basis, as if our emotions and relationships don’t matter. But that is not reality. It’s also not wise. Of course, I’m not advocating for hiring people who are incompetent just because we like them; I’m saying we should go for both. The second thing he said that I have become increasingly aware of is that it is so important for leaders to be faithful, reliable, and disciplined. I think this is a true statement, but it is also a learned truth. People prefer to follow someone who is reliable after they have seen the damage done by someone who is charismatic but lacks character. We are often easily impressed by good upfront skills or attractive personalities, but, over time, we see what happens when character is lacking. Many people I know live with the pain of following an unhealthy leader. Although they impress from a distance, they also can be manipulative, controlling, and have a “my-way-or-the-highway” attitude. One taste of that and people switch to valuing faithfulness and reliability. The lesson for me in that is to continually focus on developing my personal discipline and character. I want to have an impact on people; I also want to have an impact that lasts. Ultimately, I think charisma impresses people, but character impacts them. I want to have impact. Our friends have a huge influence on us. In today’s LeadersTip, I talk about a unique friend that can make all the difference in the quality of our decision-making. 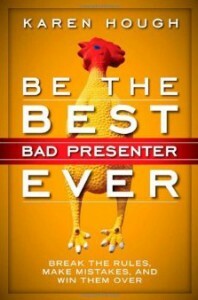 In Be the Best Bad Presenter Ever, Karen Hough does a great job of poking holes in some of the traditional wisdom on public speaking and giving some good, practical advice that will help anyone do a better job of communicating. I thought her comments on the importance of passion were great, such as “passion overrides technique.” I think it’s true that people would rather listen to someone who is passionate than someone who is slick. That seems self-evident, but it isn’t as easy as it might seem, especially if you are teaching on a regular basis, as most pastors do. 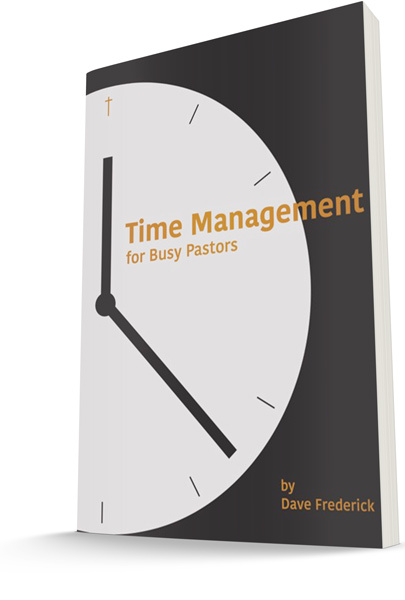 The reality for pastors is that we aren’t equally passionate about every topic. And that’s where the challenge comes in. If we only teach the topics we are passionate about, our people will get a very lopsided diet. So what does that mean for the topics that we are less passionate about, even if we know they are important? The key, I believe, is that we need to develop passion for the topic. That can be done with any topic. It requires taking time with the topic before God, meditating on it, thinking about how it applies to ourselves and to our people, and asking God to give us his heart and his perspective on the topic. I’ve seen God respond to that over and over; I think he delights in giving us his heart for his truth. It means taking time, which we often think we don’t have. But if we know that passion trumps technique, it is worth taking the time to develop it. I also thought it was a good reminder that our audiences want us to do well. I don’t think about that very often, but it’s true—nobody listening to a talk wants the presenter to do poorly. It’s encouraging to remember that those who are listening to us are for us, not against us. 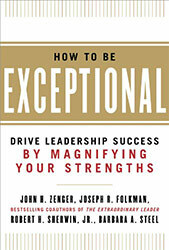 The last thing I noted was the importance of stories and that they are much more powerful than explanations. I know that; it’s a staple truth of every book on preaching or public speaking that I have ever read. Yet I find in myself a strong tendency to do the opposite. I want to explain things; I want people to understand the topic or point, and stories don’t always do that. Stories do two things—they move people to action and they make things memorable. And that is what you want if your goal in speaking is life change rather than just giving a “good” talk. Knowing that has already helped me to take another look at some of my upcoming topics with fresh eyes, and it has motivated me to start looking around for good stories to use. After all, life change is really the whole point.